The Orphanage Museum does not have the records for individual children who were wards of the State of Minnesota from 1886-1945. 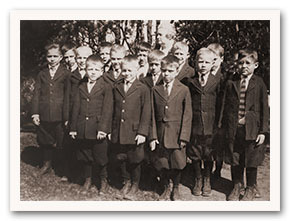 However, anyone interested in obtaining the record of a former State School child may visit the Minnesota Historical Society (MHS) Web site and select Research > Research Services > Owatonna State Public School Records or contact MHS by phone at 651-259-3300 to start the request process. Individual children's case files are available for a fee. If you would like assistance locating a record, we can put you in touch with an Orphanage Museum volunteer who has offered to help.